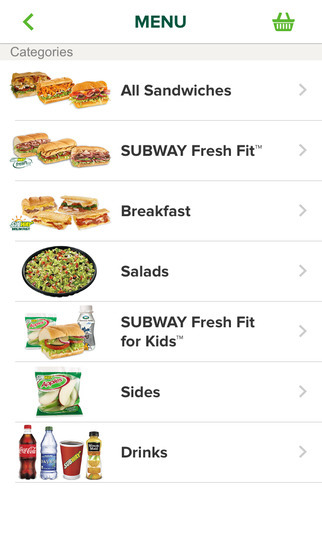 We haven't seen Jared use it yet but Subway has a new app that let's you skip the long lunch lines at Subway restaurants. 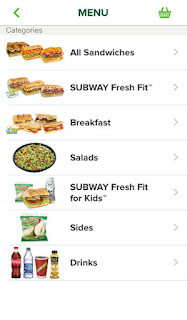 The new Subway mobile app lets you order your favorite Subway sandwiches and then pick it up at the store directly from the cashier. I've used several of the mobile apps to save time and I will review a few more here at OneCoolTip. 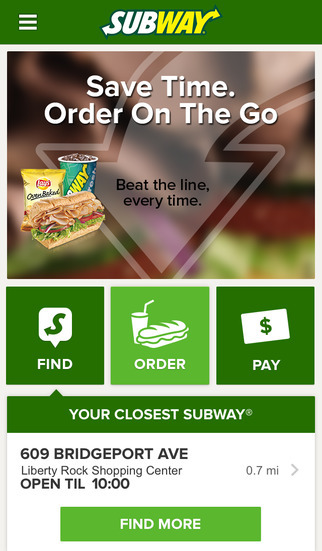 But Subway certainly brings mobile ordering to the masses with their new mobile app. In my personal experience, mobile ordering saves 15-20 minutes. And a lot of hassle. Before the app, usually there are 10 people waiting in line at the local Subway at peak lunch time. And when each person orders, he/she seems to have never been to a Subway before. What do you want? Let me think. Which bread? Let me think. Do you want it toasted? Let me think. Do you want cheese? Let me think. These people have waiting for 10 minutes already. None of these ordering concepts seemed to have been contemplated before they up up to the Subway Sandwich Artist. Avoid all of that hassle and order online through the new mobile app. 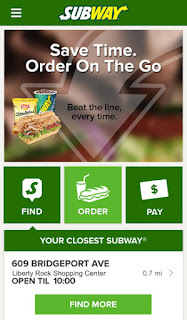 It's simple to use the new Subway app. Download to your phone. Setup a new account and then order from your local subway. You pay through the mobile app so your order will be ready to just pickup. I usually do this at least 30 minutes before I want to pick up the order. The app is new but the Subway employees seem to know the process. Although you will get some stares from the people waiting in line why you can skip the line and just pick up your order from the cashier. You can download the app from iTunes HERE and from the Google Android store HERE.